Across Australia, more and more schools are turning towards the convenience and cost-effectiveness of quality artificial grass playing surfaces when looking to resurface their existing spaces for recreation and play. If you’re looking for high-quality artificial grass for rugby that require no watering and little maintenance, you can count on Grass Solutions to help you get the job done.In addition to converting your tired and dusty playground into a well utilised artificial rugby pitch, Grass Solutions can also design and create play spaces in existing or forgotten field areas such as a centre wicket for cricket or a basketball court. Discover what we can do for your school or sporting club. 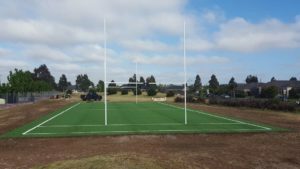 If you’re looking for high qualityrugby artificial turf that’s economical that enhances safety, PlayON 40mm artificial grass offers these characteristics and more. Additives in the yarn that make up our artificial grass for rugby enable the product to meet official standards for vertical deformation, natural ball roll and low abrasiveness. Our synthetic turf has been designed tominimise the likelihood of injury in wet or dry conditions, especially injuries resulting from falls and slides. The finished product is a natural-looking sports surface that is built tough without being tough on players. The height of goal posts that require installation on artificial grass rugby pitchesis largely dependent on the age and playing level of participants. Goal post installation is usually completed during our base work preparation of the field. If you’d like any further information on installing an artificial rugby pitch contact Grass Solutions today.